Muslim women of the Nation of Islam in Washington, D.C. at Justice or Else, 10.10.15 which drew hundreds of thousands of people. Min. Farrakhan brought the women of the Nation before the world and taught on importance and divine value of the woman. Signs displaying the importance of the sacredness, value and protection of women and girls during an historic Nation of Islam gathering. 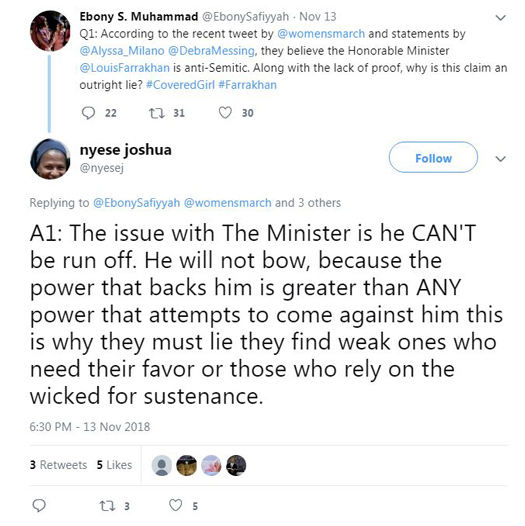 Amid recent attacks thrown at the Honorable Minister Louis Farrakhan and lies spewed by mainstream media, women of the Nation of Islam took to Twitter once again to defend the name of Farrakhan. Topics included comments made by Alyssa Milano, Debra Messing and a statement made by the Women’s March, all regarding the Honorable Minister Louis Farrakhan. Alyssa Milano, an actress and activist, is refusing to speak at upcoming Women’s March events unless Tamika Mallory and Linda Sarsour, both activists and organizers of the Women’s March, denounce Minister Farrakhan for what they consider to be anti-Semitic remarks. In the past, Ms. Mallory has had to defend her decision to work with the Minister and to attend events such as Saviours’ Day earlier this year and Justice Or Else! in 2015. Milano was among those who called Mallory out for “turning a blind eye to the hate spoken about a group of people.” Others called for her resignation, according to Atlanta Black Star. “Will and Grace” star Debra Messing called out the Women’s March for not denouncing Minister Farrakhan. On top of that, she supported Milano’s decision to distance herself from the march. What did Nation of Islam women have to say about that? “Tonight we stand to defend the Honorable Minister @LouisFarrakhan against blatant lies that have circulated. Tonight those lies will be dismantled,” was the initial tweet by Ebony Muhammad, moderator of the chat. 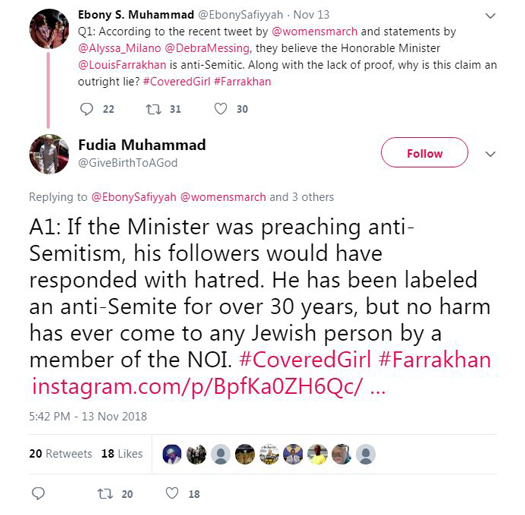 Participants were asked to explain why claims of Minister Farrakhan being an anti-Semite, a bigot, a hater of the LGBTQ community and a man who’s against women, are untrue. The sisters began firing off immediately. Many women said Minister Farrakhan can’t be classified as a bigot because of all of the friendships he has with people from various backgrounds. Not only that, but he lives by the principle of seeking knowledge. 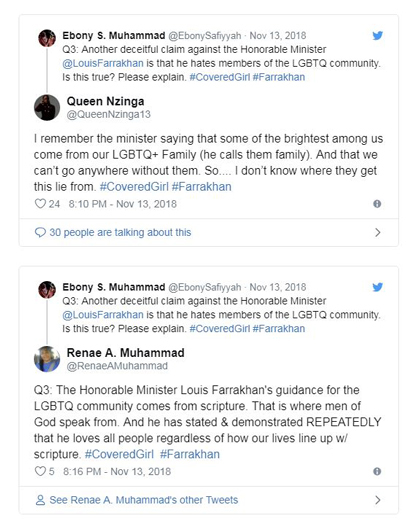 A popular lie going around about Minister Farrakhan is that he hates the LGBTQ community. The women participating in the chat debunked the claim. The women also rejected the idea that denouncing Minister Farrakhan would take away from his work, and they directly challenged Alyssa Milano and Debra Messing on their motives and their seemingly hypocritical stance. After explaining Minister Farrakhan’s stance and debunking the negative ideas that are floating around about him, participants expressed their love and support for the Minister and highlighted a few of his words and lectures that have uplifted women. Ebony Muhammad ended the chat with women still expressing their love for Minister Farrakhan. Participants continued to chime in after the chat’s conclusion. This article originally appeared on joshuastruth.com. Joshua’s Truth is a weekly online magazine that provides lifestyle, arts and culture and spirituality content for high school and college students. It is published by Janiah Adams and Anisah Muhammad, who are Final Call contributing writers and young Muslim women in the Nation of Islam. Follow Joshua’s Truth on Twitter @JoshuasTruth.